To begin I would like to say that I am a two- time recovering patient from back surgery. In 2008 and in 2010 I went though two surgeries to remove my L3-4 and L4-5 discs. I am still having an issue with my L5 disc. 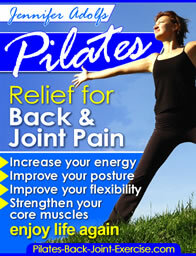 I was wondering if Pilates would be a great way to help with my current back pain issues? I'm not sure what the issue is with your L5 disc or vertebra. I'm guessing without the disc you are having some pinching or bone on bone rubbing and possibly some nerve pain. I would say that definitely yes, Pilates can help with your back pain when done carefully and under proper supervision. I have had students in my classes that have had radiating pain and numbness down their legs and into their feet due to either herniated or no discs left in the spine. Once they try some articulating Pilates exercises such as the bridge, this helps to open the spaces between the vertebra allowing cerebral spinal fluid to move up and down the spine. The extra circulation and space between the bones helps to take away their pain, and, in some cases, they even get feeling back in numb feet and toes. Check out this page to find out more about how to do the Bridge or Pelvic lift properly. And, this page will give you some more helpful information about how to exercise after back surgery. You can find these and more Pilates back and joint exercises in my Pilates Ebook available here. The ebook offers safe modifications and progressions for the classic mat exercises. I would like to exercise to strengthen my legs for walking. They feel very weak. I just had lower back surgery for pinched nerves in my back in July of 2011. What exercises can I begin now, or is it too soon? Hello Sheila and thank you for your question. First, you will want to get the o.k. from your doctor. I assume you are just feeling weak from lack of exercise at this point and not having a lot of pain in your back anymore. I would recommend just beginning with simple exercises like sitting and standing up out of a chair without pushing off. This should be done with good form of course. Line your feet up directly under your knees and hip width apart, place a ball or pillow between your knees so you engage your inner thighs and keep alignment as you stand. Shift your weight forward toward the middle of the feet and your nose over your toes, then push straight up out of your feet to stand up straight. Tighten your abdominals by squeezing the ball and then sit back over your heels to slowly lower yourself. Try to do these 8-10 times or until your legs get fatigued. Gradually increase as you are able. Another one for improving your balance and strengthening the muscles of your ankles and lower leg is the heel lift. Standing holding a counter for balance slowly shift your weight forward in the foot until your heels lift off the floor. You should feel yourself rise straight up to the ceiling. Keep spine straight. Repeat this for 10-20 repetitions or until fatigue. You can find these exercises and more to strengthen the feet and legs in my foot ebook here.